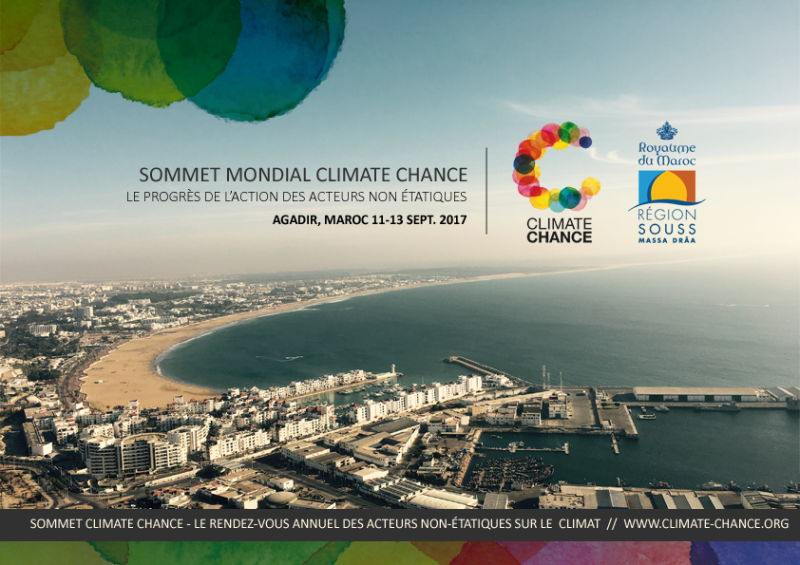 WORLD CLIMATE CHANCE SUMMIT FOR NON-STATE ACTORS from September 11 to 13, 2017. – reducing the vulnerability of countries to the impacts of climate change by strengthening their resilience adaptation. – integration of adaptation to the climate change in development policies, programmes and projects as well as in National Budgeting. – facilitation of access to climate risk transfer for disaster adaptation. The first one took place in Nantes, this 2nd edition is Moroccan and will measure the progress of the action, To deepen exchanges on successes and difficulties and to foster the pooling of experiences and innovations. Also, this edition will place particular emphasis on the stakes of the African continent and more widely the countries of the South. On this occasion, the organisers stressed: “Almost one year after COP22, This Summit will be an opportunity to take stock of the agenda of the action and in particular the Marrakesh partnership. It will also be an opportunity to prepare joint messages to be delivered to States at the COP23 as a Follow-up The Nantes Declaration, which remains the most widely signed text by non-state actors. Since the adoption of the Rio Convention on Climate in 1992 “. It should be recalled that the Declaration of Nantes was adopted at the World Summit in September 2016 in Nantes and coordinated by the Climate Chance Association. It has as its motto “Strengthening concrete action to bridge the gap between current commitments and the objective of the Paris Agreement”. The program of this edition consists of three usual pillars of Climate Chance: There are first the forums to Take stock of COP23 on the actions of the 20 sectoral coalitions (transport, energy, etc.). To these forums are added plenaries, organised in the usual way of Climate Chance. These opening and closing plenaries will address the themes of Financing, the challenge of cities in Africa and migration. The workshops constitute the 3rd pillar. A call for papers was launched on 28 February and remained open until 15 May to decide on the workshops that will enrich the program and make it a moment of sharing and reflection. The selected contributors authorize the Climate Chance Association to reuse and communicate their work. Climate Chance also thought about organising stands, totally free, Where non-state groups and African associations will be represented. The Summit also provided specific events to highlight crafts and local territory. With more than 80 workshops of good practice, which will be presented around 17 themes affecting different sectors and a large participation involving more than 3,000 members, this 2nd edition of the Climate Chance Summit is promising. READING PRISON “THE PRISM” THE URBAN GEM THAT CAN GIVE READING BACK IT’S WELL NEEDED IDENTITY AND SECURE IT’S FUTURE HERITAGE. READING BOROUGH COUNCIL NEED TO LISTEN TO THE COMMUNITY CONCERNING THE PRISON MATTER ETC. LACK OF IMAGINATION AND INNOVATION REGARDING READING PRISON HAS LEAD TO THE PRESENT SITUATION. DID YOU KNOW THAT RBC DON’T COVER CLIMATE CHANGE IN THEIR OWN COUNCIL FRAMEWORK? = THERE IS NO CLIMATE CHANGE RESILIENCE, CONGESTION EVERYWHERE, THE LOCK-GRID ONE-WAY SYSTEM. PARK AND RIDE! BUSINESS AS USUAL AND OVER CONSUMPTION WITH NO REGARDS FOR THE FUTURE. CONSUMPTION. WHERE DO WE SEE THE GREEN/SUSTAINABLE LIVING CAMPAIGNS (ZERO EMISSIONS) IN READING!! DIVESTMENT? A COMPREHENSIVE CYCLE NETWORK?? THE DELAYED ELECTRIFICATION OF READING RAILWAYS! IS THIS ACCEPTABLE!! ALL LIGHTING OF STREETS, ROADS AND OTHER OUTDOOR PUBLIC PLACES SHOULD BE OF A “WARM WHITE” SPECIFICATION, AND IDEALLY HAVE A CCT (CORRELATED COLOUR TEMPERATURE) OF 2700K. TODAY WE ARE FORMING A “HUMAN COMPASS” TO BALANCE THE LOCAL GOVERNMENT AS A SHADOW GOVERNANCE COUNTERWEIGHT. READING PRISON IS PART OF OUR HERITAGE AND SHOULD BE VALUED AS SUCH. WE WORK IN TOGETHERNESSSHIP TO FIND CREATIVE SOLUTIONS: FUNDING IS NOT AN ISSUE SO WHAT IS WRONG, WHAT IS THE PROBLEM? THE LEADERSHIP AND MUCH MORE MUST CHANGE IN 2017, I THINK I CAN SPEAK FOR ALL COMMUNITIES, THE TIME FOR CHANGE HAS COME: WE PROPOSE A “LOCAL RESIDENT GOVERNMENT” IN “THE PRISM” (GRADE II LISTED VICTORIAN ARCHITECTURE BUILDING WITH ITS RADIAL COMPASS DESIGN, YES E/W N/S) WE MUST TRY TO “SAVE HISTORIC READING PRISON FROM BEING SOLD FOR HOUSING” WHEN RBC ONCE AGAIN HAS IGNORED THE COMMON INTEREST. ANYONE OR ANY COMMUNITY GROUP CAN TO THE READING COUNCIL SUBMIT THEIR OWN SOLUTIONS ON HOW TO “SAVE HISTORIC READING PRISON FROM BEING SOLD FOR HOUSING” ALSO HOW TO MAKE BEST USE OF THIS EXTRAORDINARY FACILITY FOR THE COMMUNITY.